Ko-Fi doodle for an anonymous individual. Gumdrop came begging for me to help him out with one of his shows after his usual assistant got fired...out of a canon and into a field of cacti. However before I could even open my mouth he grabbed me and locked me in his costume trunk. After a lot of banging and yelling he eventually let me out....on stage....in front of an audience of thousands of people.....and somehow I was dressed as a clown! I tried many times to leave the stage but each attempt was thwarted by some over the top cartoon gag of his. Everything from being squashed under a giant anvil, to being inflated and reshaped into a balloon animal, to having sticks of TNT shoved down my pants. 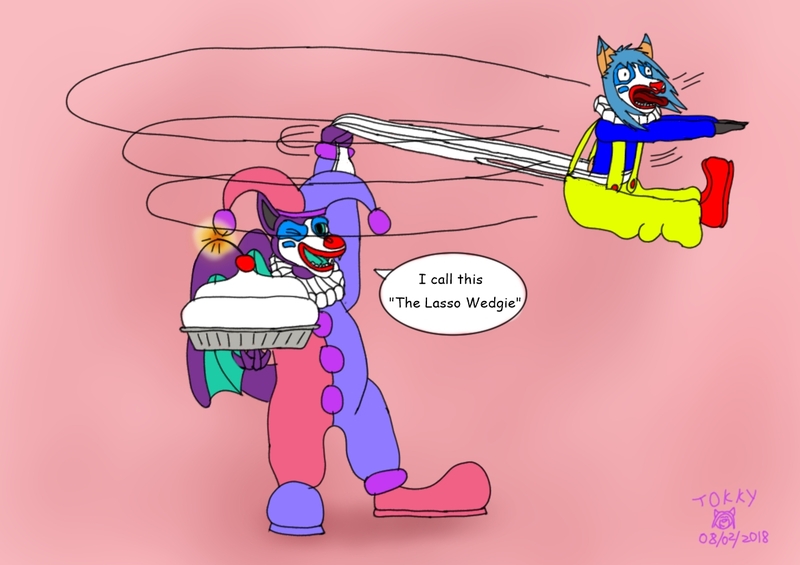 Now the clown dragon is swinging me around over his head by my underwear in what he calls "The Lasso Wedgie".